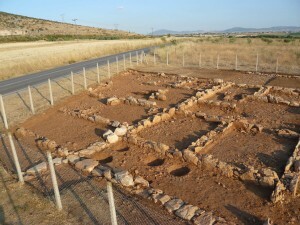 Eight houses were excavated within the enceinte of the lower town of Halos. Each house was named after a characteristic artefact found during the excavations. 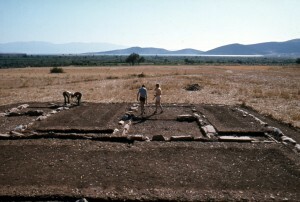 The House of the Koroplast was excavated in 1978 and 1979. The house lay along street 6 in the northern part of housing block 2.7. It consisted of a partly open courtyard and a roofed living quarter. The room at the rear of the courtyard has been identified as the workshop of a koroplast on the basis of the relatively large number of moulds and figurines that were found in it. 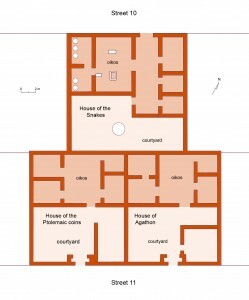 The dimensions of the House of the Koroplast were 13.75 by approx. 15.00 m.
The house was entered from the street through a prothyron with a double door which provided access to the courty­ard which comprised three areas, the roofed room at the rear end being the workshop. 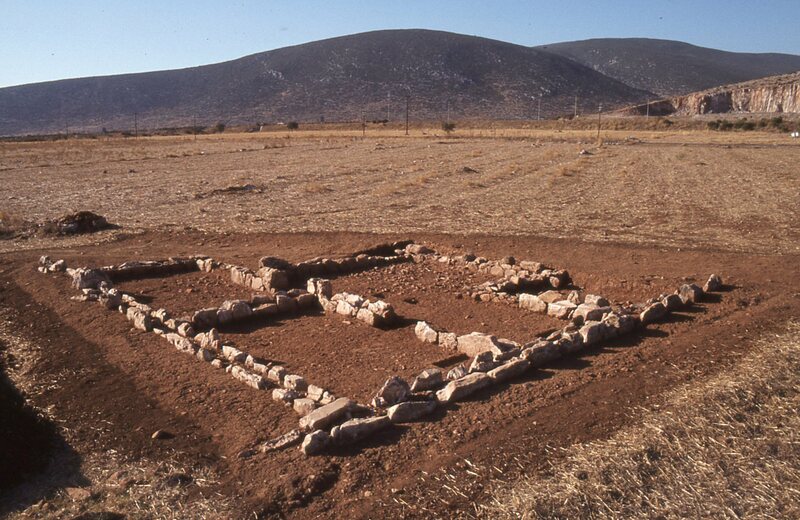 From this workshop, the living quarters of the house could be entered via a small but deep room which was probably used for weaving and/or storage. The actual living quarters consisted of a large room measuring 4.55 by 7.60 m – the largest room of the house, which has been identified as the main living room – with two smaller rooms at either side. One of the small rooms along the street was only accessible from the courtyard, perhaps a shop? Two other small rooms yielded very few or no finds while the fourth is thought to have been the cooking area. 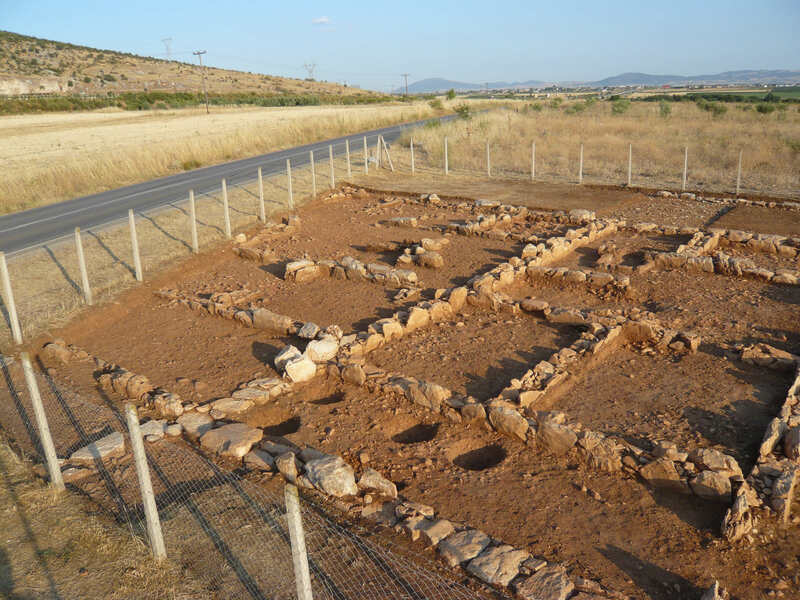 Alongside the old road running from Almirós to Soúrpi clear remains of wall foundati­ons were visible in situ at the surface: the remains of the House of the Geometric Krater. This house lay in the southern part of housing block 2.8, bordering the Main Avenue. The excavation was carried out in the autumn of 1984. Unfortunately the outer walls of the southern part of the house had disappeared in ploughing. 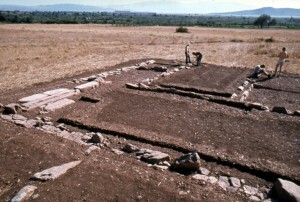 Three rooms were distinguished in the excavated area. Gaps in the foundations indicate doorways. No threshold stones were found. 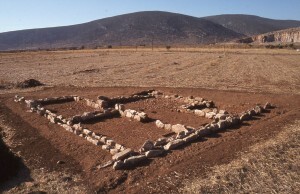 The largest of the three excavated rooms, measuring 5.85 × 4.35 m, was situated. at the centre of the living quarters. A layer beneath the Hellenistic floor level yielded some finds dating from the Geometric period. These finds consisted of three coarse pithos bases, one fragment of an unknown terracot­ta object, a two-handled cup and a decorated krater; hence the name of the house. In one of the rooms no fewer than 22 coins were found. They all date from the 4th and early 3rd centuries BC, the latest being a coin of Antigonos Gonatas dating from the beginning of his rule, i.e. c. 270-265 BC. The level at which this coin was found suggests that it dates from the time when the house was in use. The House of Agathon, which formed part of housing block 6.4, was excava­ted in the summers of 1987 and 1989. It lay adjacent to the House of the Ptolemaic Coins and south of the House of the Snakes. 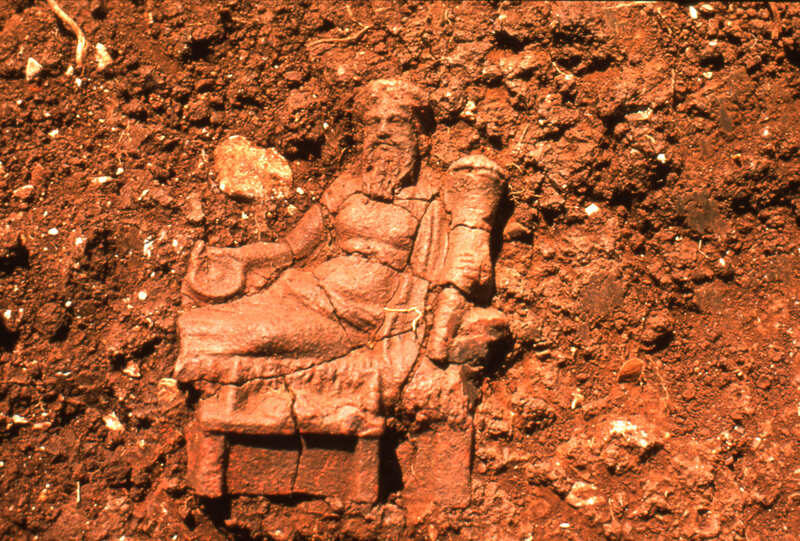 The house was named Agathon after an inscription – Agathonos – on a pithos lid found in one of the side rooms. 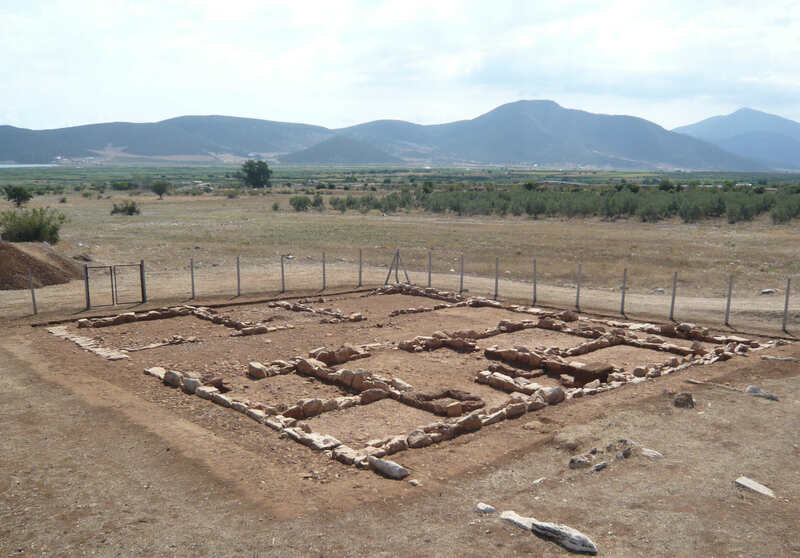 The outside dimensions of the house were 13.50 × 15.20 m.
The house’s dimensions and plan are very similar to that of the House of the Ptole­maic Coins. The plan included a courtyard along the street, which extended over the entire width of the house. An entrance from the street through a prothyron gave access to the courtyard. The roofed living quarters at the northern end of the house consisted of a central room with two smaller rooms at either side. One of the small rooms contained a very large number of artefacts, among which over a hundred loomweights, but also pottery and agricultural equipment such as a dikella, a hoe, a spade and sickles. 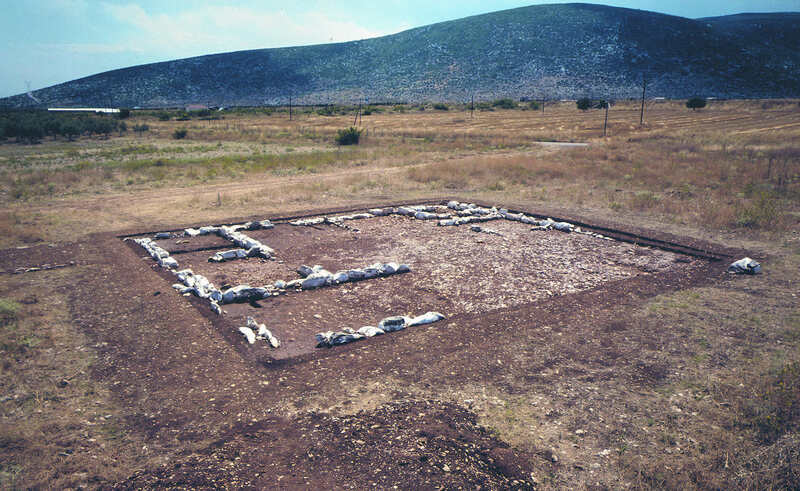 The House of the Ptolemaic Coins, excavated in 1989, formed part of the southern row of houses of housing block 6.4. The house measured 12.70 × 14.80 m on the outside, comparable to the adjacent House of Agathon. Large parts of the western and southern walls had been destroyed by deep-ploughing. Stretches of the internal wall foundations were also damaged, as was a large part of the courtyard. The internal division of the House of the Ptolemaic Coins is largely the same as that of the House of Agathon. The house comprised a roofed northern part and an open courtyard in the south. An entrance in the southern wall of the plot originally provided access to the courtyard from the street, but no traces of this entrance (probably a prothyron) were found due to the disturbance in this area. The northern part consisted of five rooms arranged in the usual layout observed in the houses at New Halos, with one large room at the centre flanked by two smaller rooms on either side. A doorway in the southern wall of the central room provided access to this part of the house from the courtyard. 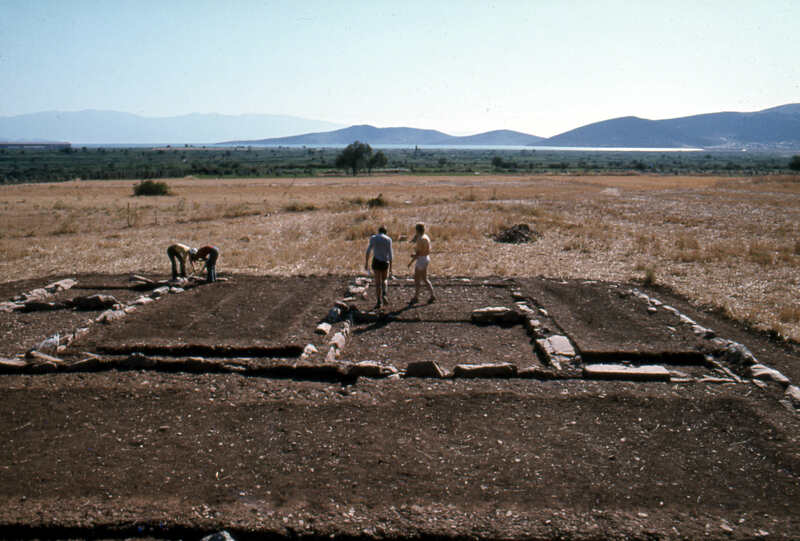 The House of the Amphorai, named after the find of several amphorai, was excavated in 1991. The remains were severely disturbed by agricultural activities. Large parts of the northwestern and southwestern walls were missing as well as parts of the internal walls. Lower levels with finds seemed to be more or less intact. The house’s dimensions were 15.50 x 14.30 m. The House of the Amphorai formed part of the southern row of houses in housing block 6.4. The remains of the House of the Amphorai were too badly damaged to allow a reliable reconstruction. It is even difficult to say whether the house was occupied in a single phase or perhaps several phases. The ex­cavation of the House of the Snakes in 1993 showed that the House of the Amphorai could perhaps be reconstructed with a courtyard along the southern wall of the plot, away from the street. This would mean that the covered part of the house bordered the street directly, which would explain why there was no prothyron at the entrance to the house. The House of the Snakes lay to the north of the House of Agathon and the House of the Ptolemaic Coins. It was excavated in eight weeks in the summer of 1993 and measured 15.10 × 15.45 m.. Part of the wall foundations were visible at the surface at the outset of the excavation. The foundations were damaged in some places, especially near the northwestern wall, where sto­nes were found to have been removed. The house was named after a peculiar find of a stone vessel containing a bone fragment, a shell, a sherd and an iron and a silver serpent; an indication for a house cult. The corridor leading from the entrance of the house to the courtyard separated the living quarters into two parts, one consisting of two or three rooms and the other of the main living room flanked by two smaller rooms. There was a hearth in the main living room and probably also in one of the side rooms and in the courtyard. Holes for large storage jars such as pithoi were found in the side rooms to the west of the central room. A well that was secondarily used as a rubbish pit was found in the courty­ard. 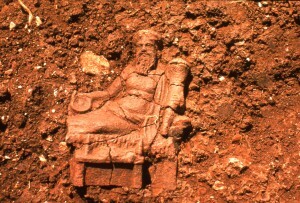 The House of the Tub was excavated in four campaigns (2007-2010) . 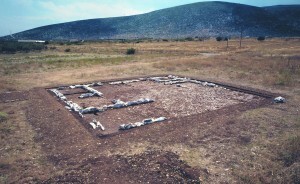 It is the largest property in Halos excavated so far; the plot measures 15.30 x 17.40 m. The limestone wall foundations were almost intact and a great number of artefacts came to light, such as storage vessels, fine black-glazed ware, kitchen ware, loomweights, coins, ironmongery and also faunal remains and seeds. Large fragments of a bath-tub were found in one of the side rooms. The layout of the House of the Tub differs from that of previously excavated houses. A close parallel to the House of the Tub is the House of the Koroplast, in particular the arrangement of rooms in the living quarters. The House of the Tub, however, has an additional row of three rooms off the east side of the courtyard, opposite the living quarters. situated along the eastern side of the courtyard. If indeed these rooms are later additions, the only difference in layout from the House of the Koroplast is the original size of the courtyard. 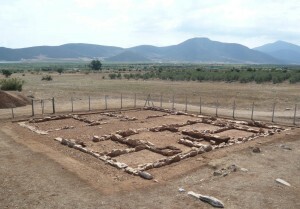 After the excavation campaigns of 2010 and 2011 the plan of the House of Agnostos was visible, except for the south-west part which is covered by the modern Plátanos-Soúrpi road. The foundations of the house were fairly well preserved; in only a few places the foundation stones had been removed by farming activities. 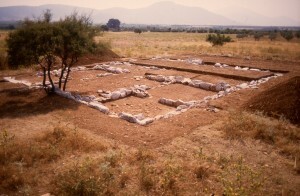 The House of Agnostos is the second house from the west in block 6.5. Only half of the house was excavated, but we do have an idea of the original size of the house as we know the size of the housing block. The end of the housing block is located 30 m west of the east wall of Agnostos. 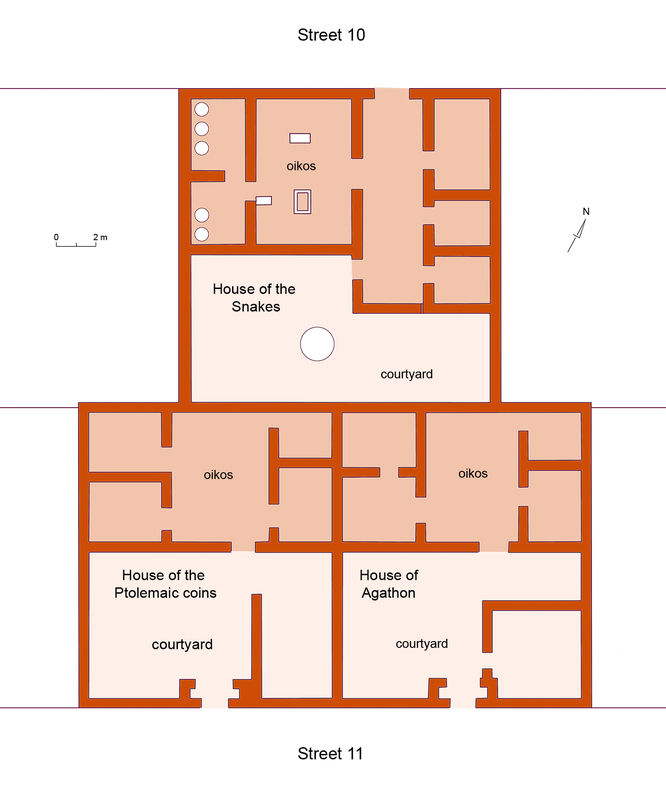 If we assume that both the House of Agnostos and the neighbouring house to its west have the same width, that is 15 m, the dimensions of the House of Agnostos would have been 15 x 15.5 m.
The main entrance of the house gave access from the street to a corridor from which both the living quarters and the courtyard could be accessed. A similar corridor is seen in the House of the Snakes. The arrangement of the living quarters is characteristic for Halos and practically mirrors that of the adjacent House of the Tub. Even though the poros structure in the central room is incomplete, it is easily recognizable as the hearth. It was placed in the centre of the room. Near the hearth an opaion, a perforated roof tile through which the smoke could escape, was found. The amount of artefacts found in the house was rather low. Most pottery was fragmented and fragile.